In the tradition of life-changing memoirs like Salvation Creek, a food-obsessed former city slicker creates her own slice of heaven in a rambling old country house on the Apple Isle. We've been there and done that with slow cooking gurus, celebrity cooks, master chefs and more than a few tree change books, and there are many pretty lifestyle books and blogs out there, but nothing is as instantly lipsmackingly appealing as Michelle Crawford's personal slice of heaven in Tasmania. Organising cocktail parties at the Opera House and drinking French champagne sounds perfectly glamorous, and for a long time it was for Michelle. But after the birth of her daughter, Elsa, the glamour started to fade and she developed a yearning for country life that could no longer be ignored. She wanted to grow her own food and, even better, learn how to cook it. She dreamed of wearing gum boots every day and creating a country childhood for her daughter - an Enid Blyton childhood filled with outdoor adventures, good things to eat and lashings of ginger beer. Just a glimpse at her hugoandelsa blog shows how she has made that dream a reality and her knack for finding beauty in the simple things of life. She inspires us to think maybe we could conjure some of the daily magic she performs so effortlessly while enjoying her better than good life in a rambling old farmhouse in the Huon Valley in Tasmania. Add glorious colour images and the sorts of recipes that have made Michelle's blog so popular and you have a beautiful colour book to treasure that reminds us all about how seductive a little bit of slow living might be. Thanks to Michelle, you can but dream from the safety of our armchairs- especially about the oodles of homemade cake - but in the meantime her story may help you take some baby steps and be inspired to make your own jam or hot crumpets . . . or maybe move to Tasmania. I have recently finished reading your fabulous book and I can honestly say I am now dreaming of life in Tasmania! From the Northern Rivers in N.S.W the climate alone is enough but your lifestyle is just something worth chasing...it has become a goal. I can't wait for my own rural slice of farmy home made life! A huge thanks and congratulations for such a wonderful book and all your fabulous recipes. 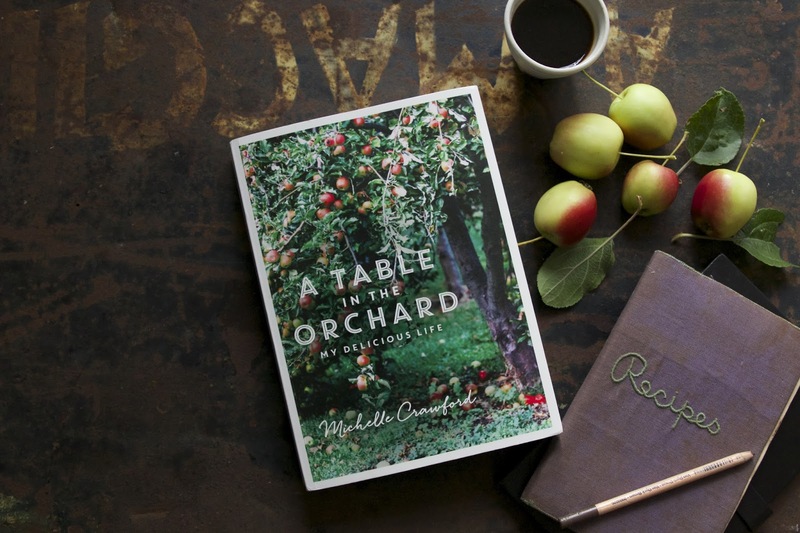 I very reluctantly finished 'A Table in the Orchard' last night. I just wanted to keep on reading it forever, every beautifully written page brought me joy. Hopefully it won't be too long until my little family can be living a similar rural lifestyle, albeit in SE Queensland. Thank you for sharing your story, Michelle. I've just finished reading A Table In The Orchard that I borrowed from the library. And I'm tempted to report it as 'lost' now that I learn it's out of print! As another devoted cook and eater, your book really strikes a chord in my rumbling belly. Thank you for sharing your wonderful stories of living the simpler life, Michelle. Hi Michelle, I was going to write to ask if you have any spare copies or if it would help if we asked your publisher directly for a reprint? I have a much loved copy but my Dad would love one too and I can't find it anywhere. Maybe gofundme is a possibility after all... I hope you go on to write more beautiful books. Elizabeth Bondfield.